It is 60 years to the day that Aurora Quezon, the First Lady of the Philippines from 1935 to 1944, was assassinated en route to open a hospital dedicated to her husband, Manuel Quezon, the country’s first nationally-elected president, who had died of TB five years earlier. And this anniversary seems as good a reason as any to draw attention to The Philippine Diary Project, a freely accessible website with interesting historical material, not least about Aurora. Wikipedia has a good biography of Aurora Quezon, as does a website run by Manuel L. Quezon III. She was born in 1888, in Baler Province (part of which was renamed Aurora Province in her honour). 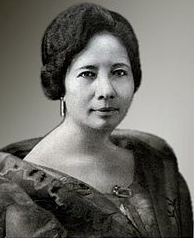 During the Philippine Revolution, which lasted until 1898, her father was imprisoned by the Spanish, and for a while she was taken in, and taught, by her aunt, Maria Dolores Molina, the mother of her future husband. In 1911, she went to Manila to study teaching but suffered from poor health. Then, in 1918, she married her first cousin Manuel Luis Quezon. He had become the first President of the Philippine Senate two years earlier, and would remain in that position until 1935 when he was elected President of the Commonwealth of the Philippines. Aurora, meanwhile, involved herself with women’s organizations, such as the girl scouts, and was active in the campaign to give women the right to vote (achieved in 1937). President Quezon was re-elected in November 1941, but the country was immediately beset with a crisis when Japan invaded the following month. The first couple evacuated, first to Corregidor, an island in Manila Bay, and then, in February, out of the country, making a long journey and only reaching the US in June. Manuel Quezon died of tuberculosis in 1944. Thereafter, Aurora moved to California for a year or so before returning to the Philippines in 1945. There she campaigned actively for Manuel Roxas, who became the first president of an independent Philippine Republic, and she helped launch and run the Philippine National Red Cross. On 28 April 1949, 60 years ago today, Aurora Quezon was on her way to Baler to inaugurate the Quezon Memorial Hospital. She was travelling with her eldest daughter, Maria Aurora, and her son-in-law, Felipe Buencamino III, in a convoy of 13 vehicles. As they travelled along a mountain road, they were attacked by a group of armed men. All three of them were killed, along with another nine in the party, and ten of the assailants. It was widely believed that the Hukbalahap - the military arm of the Philippines communist party - were responsible. Wikipedia notes that while no Philippine President has ever been assassinated, Aurora Quezon is one of three presidential spouses to have been murdered. When I first put Aurora Quezon’s name into Google looking for a diary connection, I really didn’t expect to find one. But The Philippine Diary Project emerged very quickly. I think it was set up by Manuel L. Quezon III about a year ago, although this information doesn’t seem to be available on the site itself. The aim of the site is ‘to make diaries of prominent individuals from Philippine history available to the general reader’. About 12 diarists feature on the site at present, some from unpublished works, and some from editions that were either limited, or are no longer in print. As much as possible, the site author says, the diaries are ‘either in the public domain or permission has been given to reproduce them here’. Here are three entries on the website about Aurora Quezon, all taken from January 1942, just after the start of the Japanese invasion, when she and her husband were on the island of Corregidor. Two are taken from the diary of Felipe Buencamino III, and one from the diary of Diary of General Basilio Valdes, chief of staff of the Philippine Army during the war. ‘Malinta Tunnel. I don’t like this place. Yes, it’s safer and bombproof but the air is damp and stuffy. Give me the cool mountain breezes and the starlit skies of Bataan anytime. . . Corregidor is a wreck. The docks have been bombed and rebombed. The chapel is partially destroyed and nothing remains but the cross and the altar. . .
Mrs. Quezon brought me to President Quezon. The President was wearing a white shirt and white riding pants, a striking contrast to the khaki of the soldiers in the Rock. He was carrying a short whip. He looked thin but smart and snappy. The President said that he was glad to see me fighting for my country. He said: “I was in Bataan too during the revolution as an aide to Gen. Mascardo. I know every nook and corner of that place. I got malaria there too.” . . .
She said she was in Baguio when Japs first bombed Philippines. “We thought the planes flying were U.S.,” she said. Mrs. Quezon told me to send some of our operatives to Arayat to find out what has happened to her farm. I said there were men in Arayat now looking into the matter. Mrs. Quezon recounted how she and her family went to Corregidor, how they crossed Manila Bay and how an air-raid signal was sounded in the City when their boat left Manila. She told me to see her before I leave for Bataan because she had some canned stuff for me. Very many thanks for pointing out the blog. One reason I haven't been updating it as much is the problem of historical dates, it seems to be a problem other people with historical diary blogs are having: you enter a date, day January 11, 1942 and when you post it, the system makes it today's date. Frustrating!